Exploring the Pathfinder's new ship. You spend a lot more time planetside in Mass Effect: Andromeda than other games in the series, but your ship, the Tempest, is still important. It's a lot smaller than the various incarnations of Shepard's Normandy, but squeezes a lot into its relatively slight frame. It's a scout ship, designed to quickly travel between systems, and runs on a skeleton crew. You won't see random crew members wandering around; just your small, trusted team. This makes it feel a lot less busy than the Normandy, but also more intimate. A new Nvidia driver added Ansel support for the game, a tool that lets you output ludicrously high resolution screenshots and move the camera around freely. So I thought I'd use it to explore and document the Tempest. Of course, if you'd rather explore the place for yourself when the game comes out in a couple of days, click away now. But if you aren't bothered, enjoy some 4K images of the ship. Click the top-right icon to view them full size. Ryder standing on the galaxy map platform, which makes space feel massive. Goodbye Joker, hello Kallo Jath. He's the Tempest's salarian pilot. It wouldn't be a sci-fi ship without futuristic screens everywhere. Asari companion Peebee makes this escape pod her home. 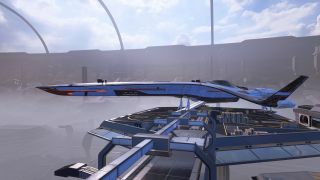 One of my favourite details in Andromeda is how you can see whichever planet or system the ship is currently in through the panoramic window on the bridge. This gives you a fantastic sense of scale, especially when you're near an alien world. It also adds to the illusion that you're actually journeying through space, even if the fancy transition animations as you explore feel a little long-winded at times. I mean, they're pretty, but they could be a touch faster. Flying around with the Ansel camera, I notice a lot of little details in the quarters of the companions. I particularly love the grotty old couch in Liam's part of the ship, which looks curiously 21st Century among all the advanced future-tech. And, for some reason, Vetra has an entire crate of cereal. Maybe turians just really love breakfast. These are small details, but help to give the people on the ship some added personality outside of their dialogue. Parts of the ship feel a lot lighter (and bluer) than the Normandy. I don't know what this does. Probably something important. The conference room, where many tense debates take place. You can upgrade and repaint the Nomad in this hangar. The Normandy SR2 from Mass Effect 2 remains my favourite ship in the series. I loved the moody orange lighting and the new areas added by Cerberus like the bar and the observation deck. The Tempest is cool, but it feels more utilitarian rather than somewhere you'd want to spend a huge amount of time. Which I guess makes sense for a scout ship. But, thankfully, you can explore the whole thing without any loading breaks or long elevator trips. Of course, while the other crew members have to squeeze into fairly small bunk beds, Ryder gets the biggest, fanciest bedroom on the ship. She has a massive window to gaze at the stars through, a big desk with space for ship models (a returning feature), and a comfy-looking double bed. The perfect place to romance some aliens and/or humans. I do miss having a fish tank, but I definitely don't miss having to feed them all the time. This is SAM, an artificial intelligence that Ryder shares a special bond with. Ryder's bedroom, where the magic happens. You'll find the ship's physician, Lexi T'Perro, in medbay. Liam hangs out here. He brought that old couch all the way from the Milky Way. If you want to give Ansel a go yourself, just press ALT+F2 to access it. But you'll need a supported Nvidia GPU and the latest drivers. When activated, time freezes and you get full control of the camera. And as well as taking regular screenshots at your native resolution, you can output to 4K, 8K, 12K, and beyond. Careful, though: the file sizes are enormous. You can also take panoramas and view them in VR if you have the tech. I don't love the Tempest yet, but I don't think I really loved the Normandy in the first Mass Effect either. But I'm looking forward to spending more time there, because, well, I love spaceships. It'll be interesting to see how it changes in the next game (I'm presuming it survives, I haven't finished Andromeda yet), and whether it'll ever feel as much like home as the Normandy did. The drive core, which looks very similar to the one on the Normandy. A top-down view of the Nomad's hangar. The bridge, with the planet Eos looming outside. Lexi's fascinated by alien biology, and that includes humans.